Knowing they were struck over and over with pigeon feces is all well and good, but Kings of Leon fans are probably looking for news regarding the band's much-anticipated fifth studio LP. Turns out they're in luck, as news has now leaked that the band's label, RCA, plans to release the as-yet-untitled album in mid-October. Of course, the release date is very tentative, but according to Direct Current Music, who apparently had a peek at RCA's release schedule, the album will drop October 19. 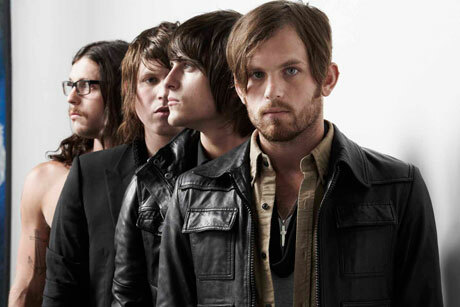 UPDATE: The October 19 release date has now been confirmed by the Kings of Leon camp, so circle that calender. Fans have known the Nashville band's fifth LP was on the horizon for a while now, as all their summer tour dates hinted. Hell, frontman Caleb Followill even told Billboard that he'd "play the whole of our new album live if it was up to us." Kings of Leon have already played a number of the new tracks live, including the tentatively titled "Immortals," "Mary" and "Radioactive."